NEW PALTZ, NY (August 30, 2017) – Historic Huguenot Street (HHS) presents the special exhibition Living in Style: Selections from the George Way Collection of Dutch Fine and Decorative Art, on view October 1 through December 17, 2017. 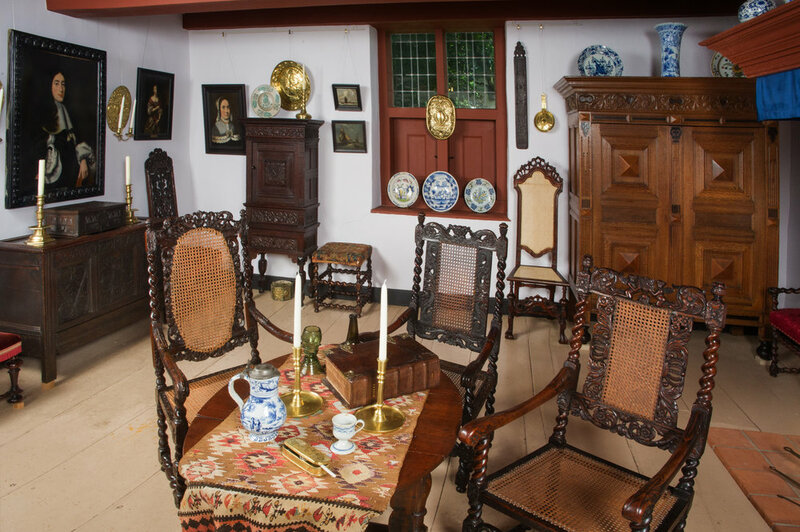 Featuring over 100 17th- and 18th-century Dutch items from the Netherlands—including 22 oil paintings, a rich diversity of interior furnishings, and decorative and utilitarian objects—the exhibition will be installed in a period room in the historic Jean Hasbrouck House (ca. 1721) and celebrate the Dutch culture that flourished in the 1600s and 1700s in New York State’s New Netherland Colony. A special preview of the room takes place on Saturday, September 30, as part of HHS’s annual Fall Harvest Celebration, 6 pm to 9:30 pm. The Jean Hasbrouck House, one of seven historic house museums comprising HHS’s ten-acre National Historic Landmark District, is an exceptional example of traditional 18th-century Dutch architecture in the Hudson Valley. The high-pitched gable roof spanning twice the depth of other stone houses from the period is thought to be unique in the United States. The interior of the house features an original open-hearth, jambless fireplace and reconstructed kruiskozijnen (crossbar windows), both typical of Dutch vernacular architecture, providing the perfect setting for the presentation. Installation view at the Jean Hasbrouck House, Historic Huguenot Street. Photo by On Location Studios, Poughkeepsie, NY, 2017. Highlights from the George Way Collection include two elaborately carved side chairs based on the engraved designs of Daniel Marot, a French Huguenot architect and designer largely responsible for the interiors at William of Orange’s palace at Het Loo, The Netherlands. Marot worked for William before and after the latter became co-regent of England, Ireland, and Scotland with his wife Mary II. The chairs feature serpentine stretchers, trumpet legs, and ball feet, all typical of the Dutch “Golden Age,” an unprecedented era of economic prosperity and high artistic achievement in the arts and sciences. Oil paintings of portraits, interiors, and genre scenes, Delft ceramics, and other decorative pieces will adorn the room. Iron and brass utensils will be featured in the jambless fireplace. rare, carved rack designed to hold 14 pipes. The room will also feature a Dutch-made cupboard or kast, a furniture form that was popularly adapted in the Hudson Valley into the early 19th century. A complementary display featuring a massive Dutch-made kussenkast—so called for its “cushion-type” doors—and over a dozen American-made kasten (plural) from the HHS Permanent Collection and selected loans will be featured in adjacent rooms of the Jean Hasbrouck House and also in the nearby Abraham Hasbrouck House (ca. 1721). “As large, free-standing wardrobes, kasten were often the most valuable item owned by a family and central to domestic life in colonial New York. While serving a utilitarian function as the primary storage for linens, these impressive pieces were quintessential to the furnishings of Dutch-American homes, signifying the heritage of the owners, as well as their wealth and social status,” said Bloodgood. Historic Huguenot Street houses one of the largest collections of Hudson Valley kasten in the country. This focused exhibition, titled Kasten in the Mid-Hudson Valley, gathers these unique cupboards from several prominent regional public and private collections, highlighting the historical uses, design, and construction of these important pieces of material culture. Beginning on Sunday, October 1, 2017, access to the exhibitions will be incorporated into regular HHS tours and featured in special focused tours on specific dates (to be announced) through December. Ninety-minute tours of the HHS campus are available hourly beginning at 10 am, with the last tour departing the DuBois Fort Visitor Center at 4 pm. Guided tours are $15 (10% off for seniors and Friends of Historic Huguenot Street). Free for SUNY New Paltz students, children under 12, and active military families as part of the Blue Star Museums program. Public programs are offered year-round. Visit the calendar of events for more information. Living in Style and the kasten exhibitions will both be accompanied by full-color catalogues. Ruth Piwonka is contributing text to Living in Style. Piwonka has worked as a material culture historian for over 40 years. She is the author of A Portrait of Livingston Manor, 1686‒1850 (1986); and co-author with Roderic H. Blackburn of Remembrance of Patria: Dutch Arts and Culture in Colonial America, 1606‒1776 (1988); and A Visible Heritage, Columbia County, New York: A History of Art and Architecture (1996, 2000). Piwonka has contributed to several other projects including New World Dutch Studies, Dutch Arts and Culture in Colonial America, 1609-1776 (1987) and Dutch New York Between East and West: The World of Margrieta van Varick (2009). George Way has been a collector of fine Dutch 16th- and 17th-century furniture, paintings, and decorative arts for over fifty years. He began his collection as a teenager; today, it is recognized as one of the finest private collections of Dutch and English furniture, artifacts, and fine arts in the country. As one of America’s leading experts in 17th-century furniture, Mr. Way served as a consultant for Christie’s New York, and has made guest appearances on The Oprah Winfrey Show and The Today Show, among others. He was named one of the top 100 collectors in America by Art & Antiques for four consecutive years (1989–92). A National Historic Landmark District, Historic Huguenot Street in New Paltz, NY, is a 501(c)3 non-profit that encompasses 30 buildings across 10 acres that was the heart of the original 1678 New Paltz settlement, including seven stone houses that date to the early eighteenth century. It was founded in 1894 as the Huguenot Patriotic, Historical, and Monumental Society to preserve the collection of stone houses. Since then, Historic Huguenot Street has grown into an innovative museum, chartered as an educational corporation by the University of the State of New York Department of Education, dedicated to protecting the historic buildings, conserving an important collection of artifacts and manuscripts, and promoting the stories from the pre-colonial Munsee Esopus landscape—dating back 9,000 years—and the culture and architecture of New Paltz’s earliest European settlers and enslaved Africans, from the 17th century to today. Open daily except Wednesdays, 10 am to 5 pm. Visit www.huguenotstreet.org for public programs, tour times, visitor amenities, and more information.